What was the common idea behind all the eminent monuments built in ancient India like the Red Fort, Hawa Mahal or Gol Konda? They were all built taking into consideration the local environment and the climatic condition of the area. In the ancient times, buildings constructed in hot and dry areas came with corridors meant for directing the wind for cooling the building naturally. On the other hand, edifices in the wet regions had shafts which could capture the natural sunlight. But with the adoption of the western techniques in building constructions, energy efficiency compromises have seeped into the architectural patterns of India. In the present scenario, it has become crucial to be conscious of energy efficiency and adopt eco-friendly measures in the construction of buildings. The Environment Protection Agency of the US has defined green building as those structures which are built around the resource efficient and environmentally responsive techniques throughout the life cycle of the building. This protocol is maintained right from siting to designing to constructing, operating, renovating and even deconstructing. In simpler words, a building which is efficient in making optimum use of the available natural resources all through its life can be referred to as green building. Buildings make up to about 33 percent of greenhouse gas emissions all over the globe. As per the reports of the US Environmental Program, these undesired emissions would be doubled by the end of 2050 if no one taken any preventive measures for reducing the negative impacts of the rapid rise of construction activity. The most effective means of tackling this situation is to adopt eco-friendly technologies while transforming the way in which the constructions are designed and erected. 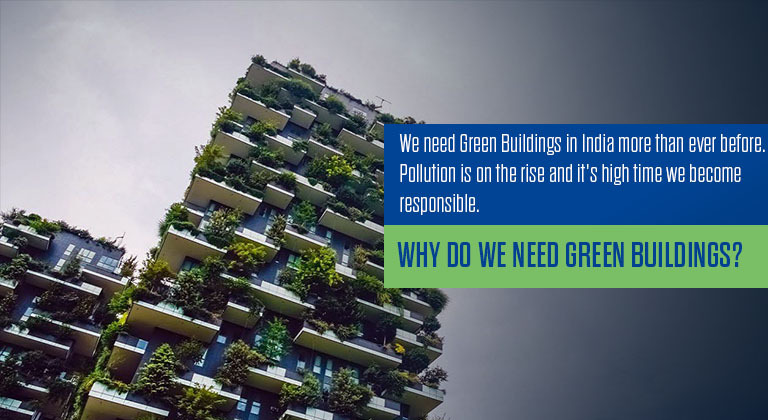 The Confederation of Indian Industry or CII formed the Indian Green Building Council in the year 2001 with an aim to create sustainable building environment for all Indians. There are 8 local and state bodies across the country dedicated in providing additional floor to area ratio or FAR for the construction of green buildings. At present, there are 4452 green buildings projects going on in the country and they have a footprint of more than 4.79 billion square feet registered with the Indian Green Building Council. In 2016, India was ranked 3rd across the globe in the ranking of LEED or Leadership in Energy and Environmental Design by the US Green Building Council. Empowered by the environmental regulation as well as growing awareness, the green building footprint of India is thought to rise at a rate of 20 percent yearly. This would create a lot of niche opportunities for building material suppliers and construction solutions. Most of the residential complexes and commercial edifice built across the nation are designed or constructed by taking into account that this space could affect the environment in a negative way. This is a common condition owing to the unawareness of the advantages proffered by the designs of green architecture. The easy and widespread availability of substandard construction materials hardly leaves a scope for sustainable architecture. Most people are unaware of the fact that buildings and construction sector of India accounts for around 40 percent of total energy consumption in the nation which is over 60 percent in case of residential building construction projects. India has grown itself into one of the most impactful economies around the globe. It has attracted investments from foreign investors while the government is also launching a number of initiatives both at national and state levels. The aim of these initiatives is to make life in urban and rural areas safer and sustainable over a long span of time. Sustainable design: With green building construction, there is no needless destruction of land involved and urban sprawl is also minimized to a great extent. Conservation of water and its quality: The natural water cycle is preserved as the site is designed in such a way that it can closely emulate the hydro-logical system of the area. Much emphasis is given on the retention of storm water along with recharging of groundwater. Welfare of environment and energy: The adverse impact on the environment is reduced by the adoption of building siting and designing, selection of materials and comprehensive use of energy conservation measures. Also, the use of renewable resources is maximized along with other low impact sources of energy. Green buildings are gaining widespread popularity since they can promote sustainability without causing any harm to the natural habitats. A green home can not only reduce the cost of energy consumption but also contribute to improving the environment. Our country needs to stimulate a large scale construction of green buildings to promote better site planning, effective use of available resources and conservation of energy. The wide array of green buildings constructed in our country will be able to enhancing the quality of life of the individuals and put a stop to the issue of depletion of natural resources.